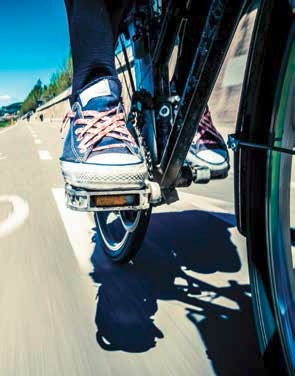 Transport is ultimately about people and the difference it makes, or could make to their lives. 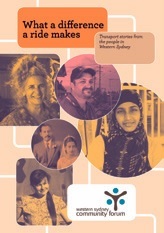 These transport stories are from a collection made by Western Sydney Community Forum. IMAGINE you need to catch a bus or a train? You know the route. You’re wait­ing at the stop in Granville. Easy, right? Not always. Not if you can’t see where it’s going… or when it’s coming… or even where it’s going to stop. You feel like pulling your hair out sometimes. It shouldn’t be this difficult. I get really angry. And disappointed. I should be able to have true independ­ence. There’s no reason why I can’t. The technology is out there to make it happen and it would be sensational. I was diagnosed with a rare eye condition when I was in my early teens. I wasn’t able to drive for very long but I remember what it was like. I’d drive my grandfather up the coast to his boat or I’d visit a girlfriend in Canberra. I’d drive everywhere. I decided to give it up when I was 19. It had become just too scary being behind the wheel. For me and everyone else. I’m forty now with a family and I carry a white identification cane. I have about 3-5% vision. I can see enough to get around. I can follow footpaths. Most of the time I can see a pedes­trian… but that’s about it. I can’t read the numbers on the front of buses and I can’t read the destinations. I use public transport at least 2 or 3 days a week: sometimes trains but more usually buses. Trains are fine if the announcements are good. They’re getting better but not always. You’ll be standing on the platform and there’s suddenly three trains in a row, with no announcements and no way of finding out if it’s the right train or not. The white cane doesn’t always seem to alert people either. I remember a time at Lidcombe station. I had one foot on the train and one foot on the platform and I’m looking at the guy in the fluoro shirt, with the flag and the whistle, and I’m waving my cane around and calling: ‘Where’s this train going?’ And he ignores me. And then door-is-closing announcement comes on and I take my foot off the train and I was so angry. I walked up to him and I said, ‘What’s wrong with you?’ And he says, ‘Oh sorry, where did you want to go?’ And I look at him and I hold up my cane and I say, ‘ Mate, I can’t read the destination board!’ And I shake my head and I say, ‘Forget about it’ and I walk off. And he’s calling after me, ‘Where do you want to go?’ but it’s too late by then. I just go and wait half an hour for the next one. These days, it’s easier to take the bus. For the past eight years, I have volunteered at a community Men’s Shed. I’m the volunteer co-ordinator. I help organise the guys, the work­place health and safety, purchasing, that sort of thing. The bus trip is fairly simple especially if I meet up with one of the guys at the bus stop. They watch for the right numbers and we get the right bus. But if the buses aren’t on schedule or I’m going to a new desti­nation, it’s tricky. The drivers aren’t always co-opera­tive. I might get on and ask, ‘Mate, can you tell me where’s this bus going?’ And he’ll look at you like he doesn’t care and he’ll say, ‘It’s on the front of the bus.’ And I’ll say, ‘Mate, I’ve a cane. I can’t see. Can you just tell me?’ And other people are waiting and it’s just really difficult. The technology is out there now. I should be able to stand at my bus stop and with GPS tracking, I’d know that my bus is coming. I’d get an alert saying ‘Your bus is 100 metres away’. And when I’m on the bus, I’d know exactly when to get off. I’d get another alert saying ‘Your stop is coming up: press the button now.’ These innova­tions are available. They’re working in other cities. They would completely change my life. I would have true independence. In the meantime, other things would improve the situation a lot. 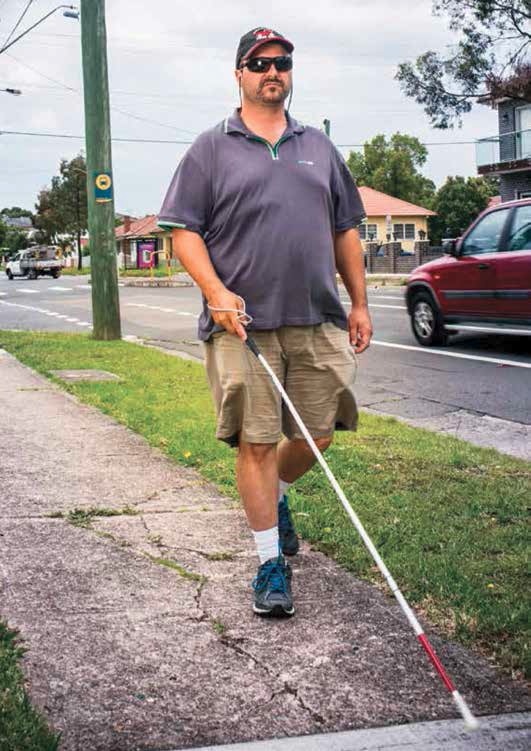 If the staff on stations and the drivers of buses were just more alert and aware that a white cane means people can’t see and they might need a little further assis­tance. Or if they would just do their job and make the announcements they’re supposed to make. Or remember to make a stop when you’ve asked them to. Or even stop when you’re standing at a bus stop but haven’t waved them down because you’re just not sure. How fantastic would that be? Thanks to Jane, Granville Multicultural Services, for linking us to Michael’s story and the Men’s Shed. One of my clients had been in and out of gaol since he was eleven years of age. His issues were anxiety, depression and significant drug and alcohol issues and when he came out of gaol this time, he was having trouble keeping his essential appointments because the transport was taking up so much of his Newstart allowance. I’d get a phone call: ‘I just missed my bus, there’s not another one for an hour, I’m going to be late for parole.’ Or otherwise, there’d be money troubles. ‘I can’t make it to the group session, I’ve run out of money.’ He was only on Newstart and the trips were costing him at least $15 a week. And then I thought, ‘He’s young and physically okay what about a pushbike?’ The exercise would be good and he’d be in charge of his own responsibilities. I knew I could get funding for that. He thought it was brilliant, and had lots of ideas about the best bike to get. I said to him, ‘Listen mate, you can’t be choosy. I’ve only got $200 for it.’ I told him, ‘you find the bike you want. Doesn’t have to be new but I’ve got to have a tax invoice.’ He came back to me a few days later: he’d done all the research, found a really good bike at Cash Converters and he loved it. For the next three months he rode to all his appointment: his parole three times a week, his counselling, his group sessions. He could get there on time and I didn’t have to ring with excuses. Two wheels made all the difference. Thanks to Michelle, Partners in Recovery, for telling us about a great initiative. 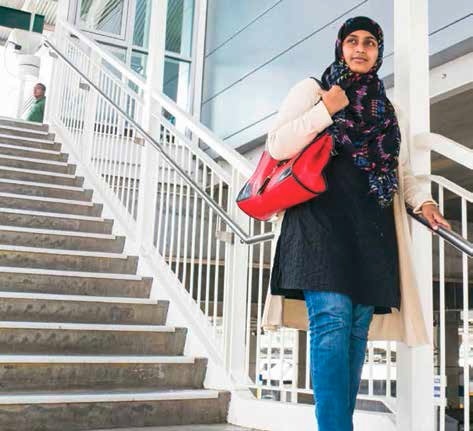 IMAGINE a newlywed Muslim woman recently arrived in Australia. She has no experience of travelling alone. She is isolated, always staying in the safety of her home. This is the story of how she was helped to journey on her own. Saffna: I arrived here with my new husband from South India. It was really new. New people, like a new world. If my husband is next to me, I am more confident, I am ok. Without him I am waiting. I am waiting each and everyday for him to come from the station around seven o’clock. Rizwan: In India we learnt English as a first language, but here the accent is different and Saffna found it diffi­cult. Many things are different to how things were before. Saffna: Every day I wait for my husband. From the window of the bedroom, I can see the Toongabbie train station. Each and every day I would go to stand there and wave goodbye in the morning and in the evening I would be waiting there again, just to see his face. I would be at home by myself all of the time. I won’t go out for a walk. I won’t go even to the shops because at that time I cannot go alone. I am very nervous. Before marriage, in Islamic culture, girls don’t go out without family members. I have not taken any train travel before my marriage. We did not use public transport. I wished to but my family is very orthodox. After coming to Australia it’s totally different. You are very independent. I don’t have any friends at that time, so he is the only person that I know. So I would be looking out the windows, watching the station, always waiting. After three months, the day arrives when I will start voluntary work in the office of SydWest. I don’t drive so I must go by myself on the train. I said to her this is a very good chance for you to explore yourself and how to take the ticket and how to put the ticket into the machine. Even that is a difficult thing for her, for all of us at first. Saffna: The first time I went alone was like this. First with my husband I bought the ticket from the Toongabbie station and together we went to Seven Hills station, but he didn’t come back with me. He got me to wait for the train by myself and travel in the carriage by myself. When the doors were closing, I felt like I am leaving for good. Yes, I cried, and other people are seeing me crying. I am just wiping my eyes and I am crying, feeling very nervous, you know. I can feel my heart beat. That’s how it happened the first trip. One stop was all I had to travel but when I saw my husband again, I cried more. Oh my God, I was so happy. Saffna: I am driving now. I am pick­ing up my children and taking them to swimming classes. Rizwan: I learned from many books that to get confident, you have to try it by yourself. It was a hard time for her maybe, but now wherever she goes she can get back. Now Saffna is independ­ent. The last time she came from India she came by herself and that is amazing! Saffna: When I see train doors closing, I still picture that first ride by myself. That confidence, I am still using every day. Thanks to Silvana, SydWest Multicultural Services, for gathering this beautiful story.